This week we discuss a typical day in the life of Bruce Lee, his habits and activities on an average day when he wasn’t filming. The Wing Luke Museum in Seattle has an exhibit called “A Day in the Life of Bruce Lee” and you can make your own “Day in the Life” infographic here. Bruce Lee believed in the restorative powers of sleep, typically getting about 8hrs a night. He went to sleep around 11pm and got up at 7am. In the mornings he would stretch and go for a jog. Bruce liked to use jogging as a form of meditation. Bruce spent his early evening hanging out with the family and playing with the kids. Then for the rest of the evening, from 6pm on, Bruce would have dinner and extra training with his students and friends. He had a Wednesday Night group, mainly students from his classes, who would come over for extra instruction and philosophical conversations that would turn into a communal dinner. Bruce didn’t have a regular 9-5 job, but his workday consisted of a few hours of concentrated effort, a break, and then a couple more hours of concentrated effort and so on rather than one long 8 hour stretch. This Day in the Life of Bruce Lee shows what productivity and harmony is possible for anyone. What's obviously missing from his daily routine is any TV or computer time. Bruce dedicated time for physical, mental and spiritual development in his daily life—creating a harmonious day filled with training, learning, teaching and connecting with family and community. Take Action: Research your own experience. Take the time to document your every day for a week or month to see how you spend your time. There are so many different ways to document your day with modern technology, find the app or tool you want to use. It’s helpful to have an overview of how you spend your time. Are there any changes you’d like to make or things you’d like to add to your life? You can also create your own day here. If you’d like to share how you’re doing with this action item you can email us at hello@brucelee.com or on social @BruceLee. We’ve been receiving a lot of emails from our listeners updating us on their #ActionItems and their #DefiniteChiefAims so we’d like to share a few of them with you. You can check out more emails from our listeners online at Brucelee.com/podcast and listen to Episode #6 about Bruce’s Definite Chief Aim. “Hello,I really enjoy your podcast. I can't wait until there's a new episode each week. In your episode Walk On you asked us to consider what words or phrase has helped us in life or in times of need. I spent a couple years in Hong Kong about 25 years ago and I really love the Cantonese word góijeun (to improve) and the phrase yātbouh yātbouh jeunbouh (step-by-step progress). As I understand it, gói means to change and jeun means to progress, and together they mean to improve. I thought about this word alot as I was learning Cantonese and it helped me to keep working at it, especially when I thought of it in conjunction with yātbouh yātbouh jeunbouh, or step-by-step progress. I wanted to be instantly fluent but I wasn't. It took time and these words helped to constantly remind me that it would come and that it was okay to be patient with myself. “Hello Shannon and Sharon! I am writing to express my gratitude for your work in creating the Bruce Lee Podcast. I caught the podcast and have been listening since around the time episode 3 was released. 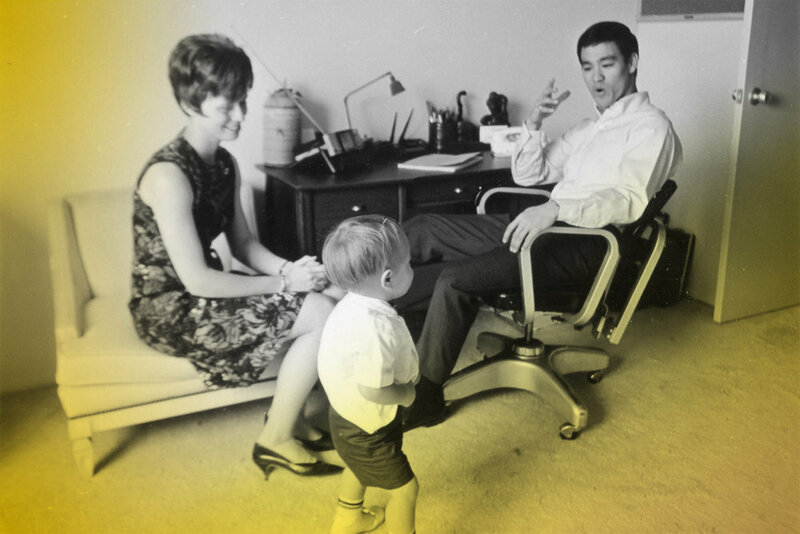 Being interested in Bruce Lee's work for some time, I find the personal stories Shannon tells of her father very insightful and they help ground my conception of Bruce's philosophy in reality. I also wanted to say that I loved the shout out to Alexander Massialas a few episodes back - when I was younger I actually fenced with him in the same club and it was so cool to hear an often unrecognized sport get some recognition, especially for an awesome guy like Alex! In listening to the most recent episode (Walk On), an interesting comparison struck my mind with my Irish ancestors who immigrated to America and had to overcome challenging and adverse circumstances. While I in no way wish to compare the struggle of accurate representation in contemporary/past media to immigration in the 1800's, one thing that always stuck with me was that my great-grandparents, no matter how tough the times were, would also take a "Walk On" mentality. Times were hard for them as they adapted to a new lifestyle in the U.S. Irish Americans were discriminated against when they first immigrated, and I have heard some tough stories of the live they had to endure when they first moved over here. But, once immigrated, my ancestors would unapologetically be themselves while recognizing they played a part in their society - they overcame and adapted when necessary in the new world they threw themselves into and would continue to "walk on" despite often being down for the count. Not necessarily a Bruce Lee moment for them, but certainly taking to heart what would be later be his philosophy! This week’s #AAHA is Maya Lin, an American designer and artist known for her sculpture and land art. She first came to fame at 21 as the designer of the Vietnam Veterans Memorial in Washington, D.C. She was born in Ohio and her parents migrated to the US from China, her father was a ceramist and her mother was a poet. Maya studied at Yale and has been awarded honorary doctorates from Yale University, Harvard University, Williams College, and Smith College. Maya won a public design competition for the Vietnam Veterans Memorial, and it was a controversial design since it was non-traditional, she was an Asian female, and she lacked professional experience. Maya actually had to go before Congress to get them to approve her design. She has said that had it not been a blind selection process then she wouldn’t have been selected. Now she owns and operates the Maya Lin Studio in NYC and in 2016 she was awarded the Presidential Medal of Freedom. Maya we love your work and think you’re awesome! A few months ago I mentioned that I was going to share a thought from your podcast as my leadership moment in staff meeting at work. I wanted to take a moment and let you know how it went. The thoughts that I ultimately decided to share came from your episode on Goals, Mistakes, and Success. There was so much in that episode that has stuck with me, from aiming high in your goals in order to broaden your horizons and see what is possible, to listening to your mistakes in order to grow, to recognizing that defeat is a state of mind and only has power over you if you accept it, to defining success as "doing something sincerely and wholeheartedly." It all connects with me on many levels. While sharing Bruce's quote on mistakes I shared that I appreciate him describing it as "listening" to his mistakes. To me that gives mistakes a voice and a presence as if they are temporarily embodied and brought from the past to the present in order to have a meaningful conversation with them, learn from them, and then let them go and move on. Additionally, I learned from a Seven Habits class a few years back that the Chinese character for the verb "to listen" includes within it the characters for ear, eyes, and heart, meaning that when we genuinely listen it is a full body experience. We don't just hear, but we also see and feel - we are fully and wholly engaged. It's like the act of listening is it's own complete ecosystem of seeking and gaining understanding. To me, that's very Bruce Lee. And combining this view with his quote adds layers of meaning for me to this act of "listening" to my mistakes in order to grow. In the end, I shared his thought that "a purpose is the eternal condition of success." To me that conveys how treating success like a journey and having a sense of purpose means you act and do for the sheer joy of acting and doing and becoming, and that the moments that are typically thought of as success - achieving a target, reaching a milestone, being recognized, receiving an accolade - these moments are really consequences or markers of the actual success, which is found in the doing. Outside of this experience of sharing Bruce's thoughts in my leadership moment in staff meeting, I have found myself sharing these thoughts in conversation with others, such as my wife, children, friends, and co-workers. I thoroughly enjoy your podcast.